Knobs: Gain, Level, & 3 EQ, Weight: 4 1/2 lbs. 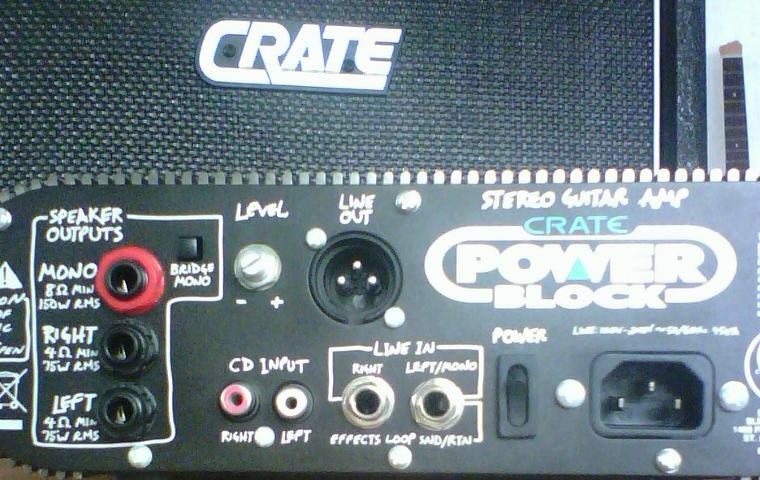 Above is a rear view of the Crate PowerBlock Stereo Guitar Amp Head, with 1/4" speaker output jacks for both stereo or mono use, including bridge mono. There is also a balanced XRL Line Out jack with it's own level control. A 1/4" headphone jack is located on the front panel. Besides the 1/4" input on the front panel, the Crate CPB150 stereo solid state amp head has a pair of RCA input jacks for CD or Tape, and a dual purpose line in / stereo effects loop for adding external effects or for patching an external line level signal into the Power-Block. The Power Block Amp Head also features speaker simulation circuitry for enhanced sound at each of the audio outputs.